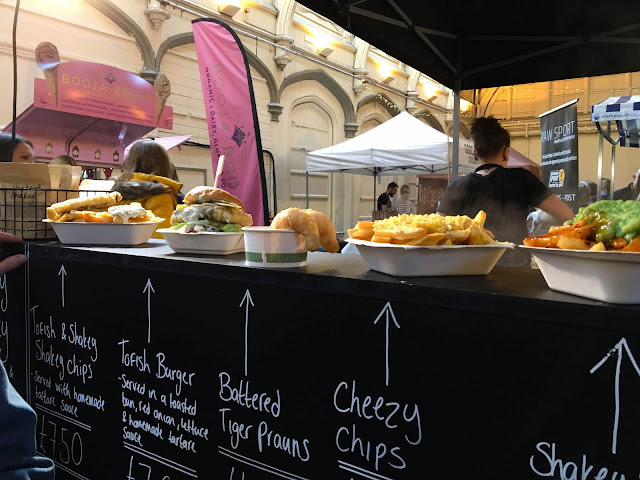 An afternoon at The Free From Festival at The Passenger Shed in Bristol earlier this month - a festival for free from foods, all gluten free and free of refined sugars. I love Bristol. It's one of my favourite cities. I'd love to move there one day. I keep telling Mr CB that I'm going to buy us a place near the Harbourside when we win the Lottery. I literally look for excuses to visit there all the time. Something going on at the cathedral? I'm there. A bloke dressed up like Brunel on the SS Great Britain? Yup. Sunny out? Book me in. 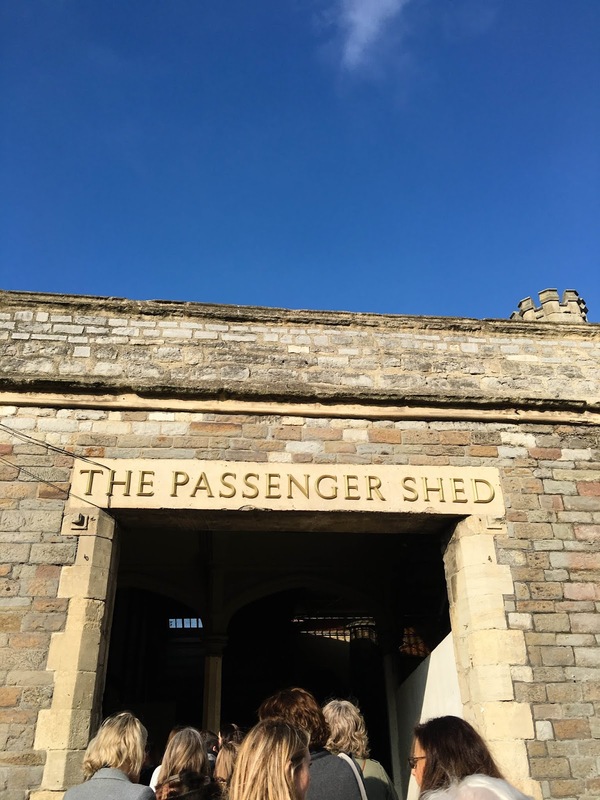 So imagine how excited I was when I found out lovely Bristol was hosting the Free From Festival this month, in The Passenger Shed, a few steps away from Bristol Temple Meads Railway Station, which is so handy for those travelling into Bristol, like us. On arrival, the venue was really well organised. You showed your paperless e-ticket (saved on your mobile phone) to someone on the way in. On arrival, we were offered a drink - either watermelon or cactus. The kids picked watermelon, and we started browsing the stalls. The hall was packed with stalls - a quick look at the exhibitors' list on the app and there were over 60 stands. 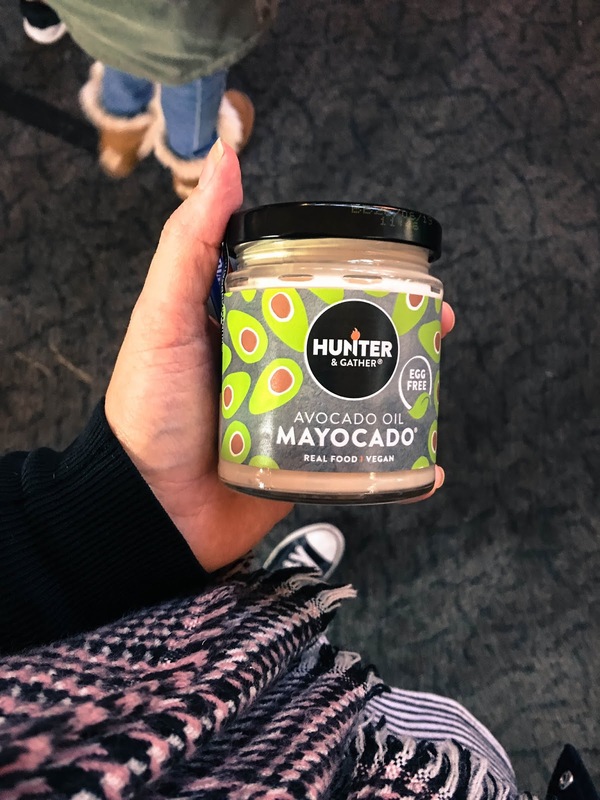 I clocked Hunter and Gather, the paleo mayonnaise people, on the way in. I love their mayonnaise, and picked up one of their jars of their new vegan avocado oil 'mayocado' to try out when I got home. It was great to meet the people behind the company too, and say hello. There was a great mix of hot and cold food and informational stands, too. 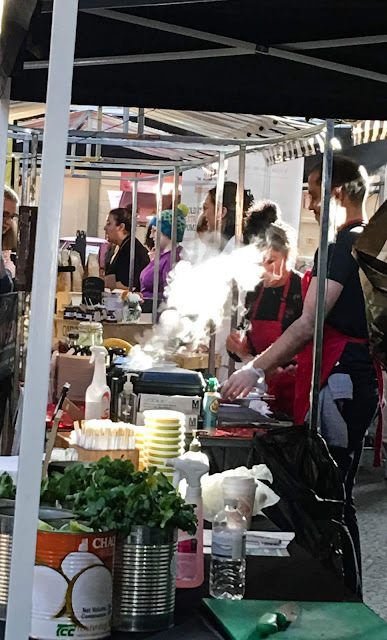 The most popular appeared to be the Shakey Shakey stand, where they were making vegan Tofish and chips and a long queue had already started to form. Curious, I bought a portion for me and the girls to share. 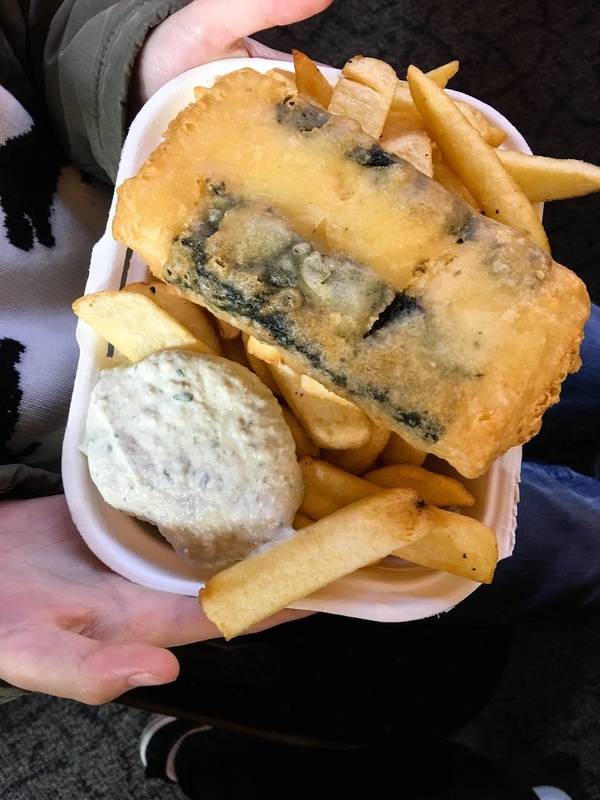 The slab of tofu was deep fried in gluten-free batter with a strip of seaweed inside and served with chips dusted in their signature spice blend and a spoonful of vegan tartare sauce. They also offered vegan prawns in batter; chips, mushy peas and gravy - and a gorgeous looking Tofish burger. I'm not massively into tofu but it did taste really good. The girls polished it off between them and said they'd have it again. I even sent photos to my vegan Mum to make her jealous. And it did. We saw Pho, the noodle restaurant also had a stand (we love Pho, in Reading) and along from them was a gluten-free waffle stand run by Waffleland. So we lined up and bought three - one each (yeah, we weren't going to share these), all paleo, and made from chestnut flour - the girls had chocolate sauce on theirs and I just chose maple syrup. It was gorgeous, and such a great change to be able to walk around and find foods that weren't just gluten-free, but pretty nutritious, too. And even better to find something totally paleo! Brilliant. Other stalls we loved were Nomad Health, who make grain and gluten-free pasta - we're already big fans of theirs - also Green Sisters Ltd, with gorgeous gluten-free Indian samosas, and Seaspoon Seaweed - they produce seaweed flakes you can sprinkle into your foods for added nutrients. 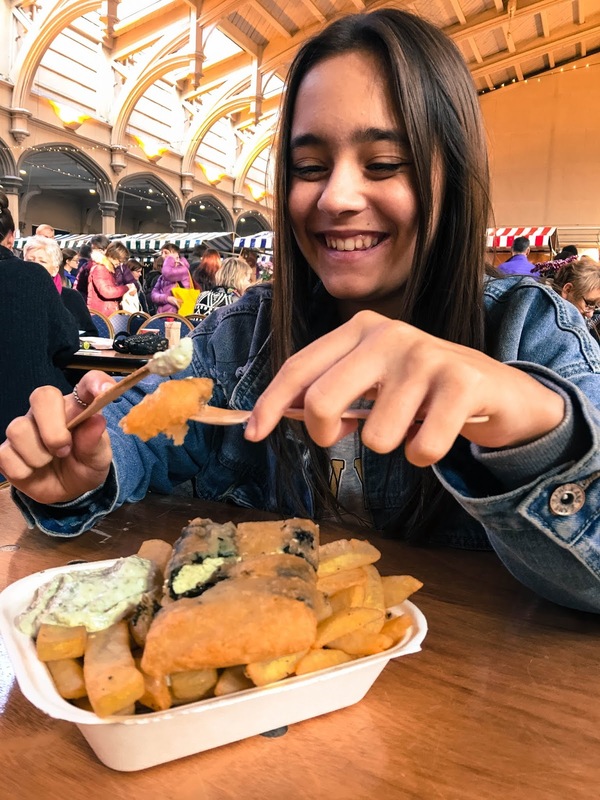 The whole atmosphere of the place was buzzing - I love Bristol anytime, and I find the people really friendly, and this was no different. It was busy but there was still plenty of seating for those who wanted to sit down and eat. The stage was towards the back of the hall, and the whole hall was decorated with fairy lights to add to the cosy, relaxed atmosphere. We caught a glimpse of one of the talks, which were going on throughout the day, along with music - but we wanted to browse through the stalls, so didn't spend much time watching. It was probably one of the most relaxed, enjoyable and friendliest food festivals I've ever been to and we were really made very welcome. The event was advertised as a cash only event, but some exhibitors were taking card payments, which was brilliant. However, I wouldn't rely on this next time - definitely take enough cash with you so you don't miss out on foods you want to try. I am definitely keeping in touch with Free From Festival, to find out about future venues. They've put on events like this in London as well as Bristol, and I understand they may be looking at planning venues further north next year, too. If you're into free from living, I'd definitely urge you to go and follow them on Instagram. They regularly showcase their exhibitors on there and you'll find interesting new companies to follow and products to try. 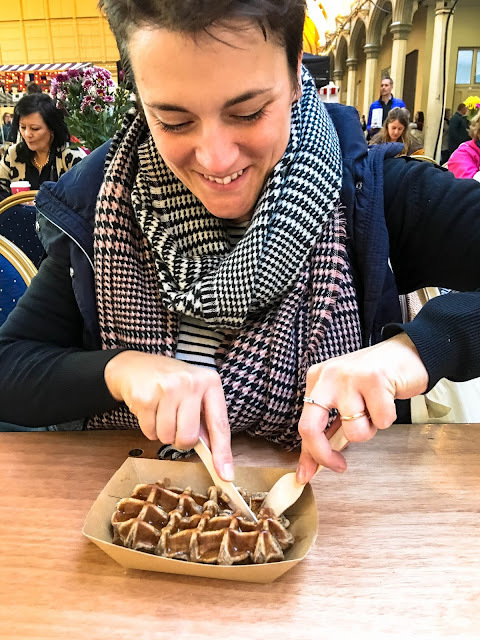 Unlike many 'free from' food festivals, there's a real effort here to showcase products that aren't just gluten free and loaded with refined sugars and dodgy sweeteners, but are gluten free and also nutritious and good for you at the same time. I love it. Find out more at Free From Festival's Instagram or website, where you'll find a list of the exhibitors, too. Thank you to The Free From Festival for inviting us along and providing me with a press pass for the event. Can't wait for the next one! Have you been to one of the Free From Festivals? What did you think? Let me know in the comments below!